While it is convenient to group commodities together and analyse them as an asset class, the supply and demand balance across individual commodity markets is very different. 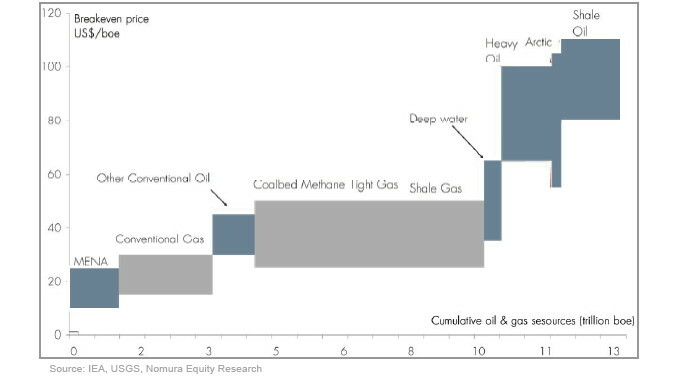 This is well illustrated by the hydrocarbon commodities; oil, coal and the evolving global market for natural gas. This article provides a brief overview of the pricing of these commodities in the context of their supply and demand balance. Market pricing of oil is complex. There are a number of drivers that interact to determine prices: the short term relationship between demand, production and inventories, the influence of OPEC, expectations around future production costs versus demand, the geopolitical risk premium and the increasing influence of large investment flows. But of the three hydrocarbon commodities, oil presents the strongest case for a structural shift to higher prices as a result of scarcity. Annual global demand for oil is substantially higher than the volume of reserves discovered each year. One of the drivers of rising oil prices over the last decade has been an increase in the expected cost of extraction as more accessible reserves decline. But at current price levels there are a range of unconventional oil production methods that have the potential to open up new reserves. 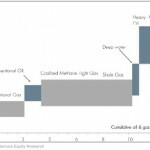 Deepwater drilling, oil sands and shale oil all promise new production in a cost range estimated to be somewhere between $60 to $120 a barrel as illustrated in Chart 1. However the environmental impact of extraction of unconventional oil is a substantial hurdle to turning that promise into reality. Production of oil sands and shale oil is very carbon emissions intensive and the risks of deepwater drilling need no introduction after the 2010 disaster in the Gulf of Mexico. Despite these issues the location of large unconventional reserves on the doorstep of an oil hungry North America means that extraction is likely to play an important role in future supply. Over time the demand for oil is likely to respond to higher price levels with increasing energy efficiency and substitution to other forms of energy. Given that around two-thirds of US oil consumption is associated with transportation, increased fuel efficiency in vehicles will play an important role. Looking forward to the next decade electric vehicles have the potential to drive large scale oil demand reduction, although this will in turn increase demand for power and hence for thermal fuels (specifically coal and gas). But any recent response of demand to higher prices has been overshadowed by the strength of oil demand growth recovery since the financial crisis as shown in Chart 2. 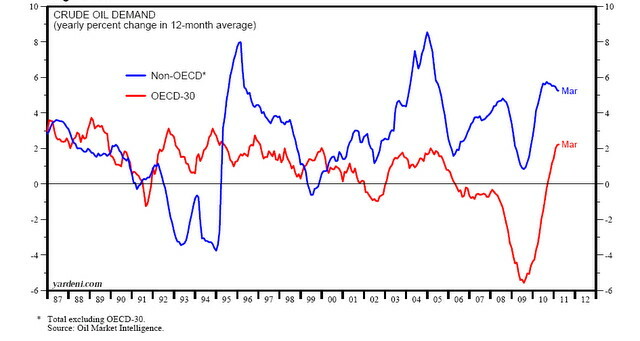 Chart 2 also illustrates the impact of a global economic downturn on demand. A stumble in global growth, for example from a slowdown in China, may cause a sharp decline in prices. But given the underlying growth in vehicle consumption in developing economies this is likely to be a temporary condition. In the absence of a substantial shock to global growth it seems reasonable to expect a continuation of the higher price levels and price instability experienced over the last few years. In addition oil is also uniquely exposed to security of supply concerns, given the scale of dependence on production from the Middle East and North Africa. A civil war in Libya has already influenced the geopolitical risk premium, but serious unrest in Saudi Arabia could result in a disorderly increase in prices and volatility. In contrast to oil, the majority of global coal demand is sourced domestically. Exports account for only around 18% of coal produced globally with pricing focused on supply from several large exporters (Australia, Indonesia, Russia, Columbia and South Africa). The delivered export price for steaming coal includes transport cost which effectively divides the global market into two geographical zones; the Atlantic basin focused on the Amsterdam-Rotterdam-Antwerp (ARA) hub and the Pacific basin focused on the Newcastle (NEWC) hub. The Richards Bay (RB) hub in South Africa provides an important role in constraining price divergence across the two basins. Marginal demand growth for export coal has recently been heavily focused on China and India where new coal fired power stations have dominated the increase in electricity generation to support economic growth (as shown in Chart 3). But scarcity of supply is a very different issue to the oil market. Despite explosive Asian demand growth driving coal prices above $100/t this year, there are vast global reserves of coal that can be sourced at costs well below this level. The vertiginous swings in coal market pricing over the last five years illustrate the lack of short term supply responsiveness in the face of fluctuations in developing world demand. The ARA coal price climbed from around $50/t at the start of 2006 to above $200/t in 2008, driven by booming Asian demand and a number of production disruptions in key exporting countries. Coal prices then halved in a matter of weeks as the global economy went into a tailspin following the collapse of Lehman Brothers in September 2008. Prices stabilised at $60/t in Q1 2009 as the half a trillion dollar Chinese economic stimulus package took effect and have steadily risen back above $100/t as Asian growth has recovered. The evolution of coal market pricing will to a large extent be determined by the sustainability of growth in India and China. As long as growth continues at the current pace, there is a strong possibility of a period of prolonged coal market tightness as demand growth outstrips the ability of supply to respond. But beware a market where prices sit above long run production cost. Recent history has illustrated the impact on prices of a shock to Asian growth. Natural gas has only become a global market relatively recently. North America, Europe and Russia have historically dominated global gas consumption with gas sourced through pipeline networks from production fields. But declining domestic reserves in these regions has lead to a boom in Liquefied Natural Gas (LNG) infrastructure and shipping capacity over the last decade which has facilitated the global trading of natural gas. There are still three distinct pricing regions: Henry Hub in North America, the European spot hubs (eg NBP and TTF) and the Asian region centered around a Japanese hub. But the ability to move gas between regions via LNG cargoes means that global pricing is increasingly interrelated. The gas market provides an interesting illustration of rapid supply side innovation in response to higher demand. 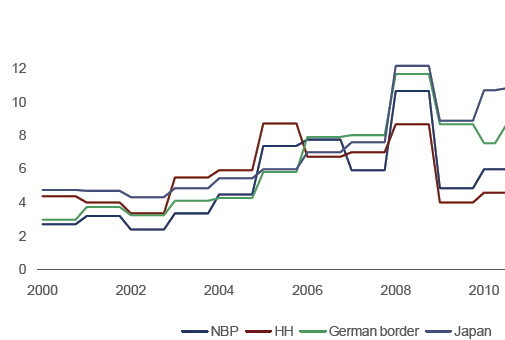 Gas prices rose rapidly across all regions between 2003 and 2008 to reflect a large increase in anticipated LNG import requirements as domestic gas reserves declined. Gas, like other commodities, sold off sharply as demand fell following the financial crisis. But this coincided with a dramatic change in the global supply/demand balance as breakthroughs in unconventional gas production techniques opened up vast reserves in the US. The realisation of the potential of unconventional gas reserves occurred just as large amounts of new LNG production capacity came online in anticipation of meeting future US import requirements. The result was a period of global supply glut in 2009-10, with surplus LNG flow from the Middle East driving European spot prices down towards US levels (see Chart 4). Under these conditions Japanese hub pricing sits well above Europe and the US given the significantly higher transport cost for Middle Eastern gas to flow to Asia. Several factors over the last year have been working to alleviate the supply glut. Power market gas consumption has been robust given higher coal prices, global gas demand has recovered with economic growth and the Japanese nuclear shutdowns have increased the demand from the world’s largest LNG importer. As a result European gas hub prices have diverged from US prices and are once again converging on oil-indexed contract prices as we explore in more detail here. Over the next decade the role of gas fired power plant in the decarbonisation of power generation is likely to be a key determinant of how long the global supply glut will remain. While the supply glut may dominate global gas pricing for some years to come, particularly if there is another slowdown in economic growth, an increase in European and Asian dependence on LNG may drive sharp price swings on a shorter term basis. LNG is playing an increasingly important role in providing seasonal flexibility in Europe and as a result in setting hub prices. A large field, pipeline or storage disruption may see European buyers forced to pay significantly higher prices as they compete with Asian importers for Middle Eastern LNG cargoes. Technology already exists to convert gas and coal to liquid products similar to diesel or gasoline. In the long run the commercial deployment of this technology and improvements in demand substitution are likely to constrain the dramatic divergence of prices across the oil, coal and gas markets. But currently these three markets are characterised by markedly different supply and demand balances. What is common across the markets is the influence of rapidly developing economies in driving marginal demand growth. The extent to which this growth remains stable will be a key driver of price levels and volatility. A global economic downturn, particularly one impacting developing economies, may cause a sharp selloff in global energy prices. However on a twenty year horizon there is a powerful structural story around the emergence of China and India driving an increase in global competition for the hydrocarbons required to fuel economic growth. Note: this post follows on from Global commodity markets (Part I): a paradigm shift?.